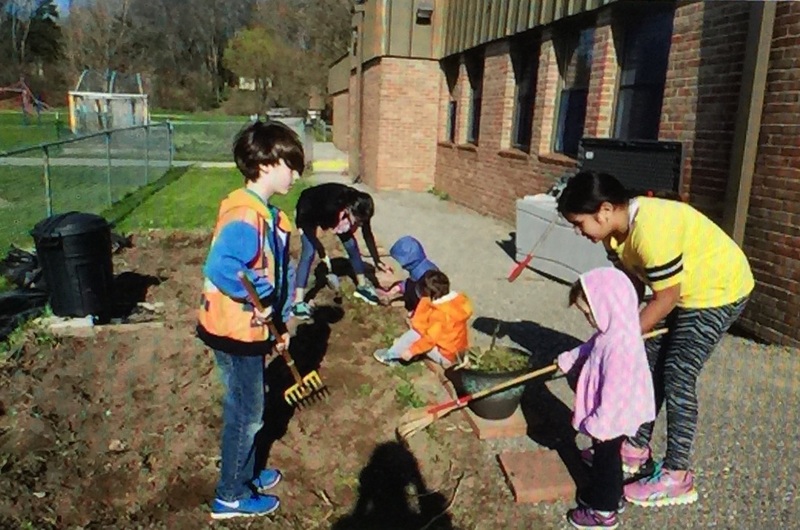 Michigan Green Schools helped Zambia start a Green School program based on the Michigan model. Anastasia School in Ndola, Zambia is pictured above celebrating their Green School designation, the first in Zambia. Congratulations Anastasia School! The students are green penpals with Traverse West Middle School. They are holding pictures of their new friends. Congratulations to all our 2019 Green Schools on their fantastic achievements! If you're interested in applying for the 2019-2020 school year, reach out to your county coordinator to learn more! All official green schools may use the Michigan Green School copyright logo on websites, newspapers, yearbooks, etc. To request the vector logo, please contact us. ​If your school is interested in a Zambia Penpal project we have an invite from the Mwaiseni School, grade 1-6. Contact us for more info. The Red-shouldered Hawk is a threatened species in Michigan. To learn more about the recovery plan and what you can do to help, visit the Michigan Department of Natural Resources (DNR) website and print our coloring sheet for a fun activity. The coloring pages are copyright free for participating Michigan Green Schools. A top goal again this school year is reducing food waste. For every 1 lb. of food waste composted, 6 lbs. of greenhouse gases are kept out of the atmosphere! Schools can get a compost bin or compost units for classrooms and know they are making a great contribution to protect our earth. Learn more at https://www.smarterlunchrooms.org. Start an anti idling campaign at your school.The idling while waiting for students wastes energy and pollutes the air around the school grounds. Do an information blurb on your website and parent newsletters. Many will be glad to help out! Make a plan to support the health of the Great Lakes Watershed. Schools can participate by signing up for an Adopt a Beach location all over Michigan! Not near a beach? A clean up on local rivers helps the Great Lakes Watershed too because rivers feed into the Great Lakes. To learn more about protecting the Great Lakes, visit the Alliance for the Great Lakes website. Rather than adding to the amount of textiles already in our landfills, host a clothing and textiles collection at your school. Some items like towels and blankets could go to local animal shelters for reuse, and other items can go to local thrift shops for resale and/or textile recycling. Visit our Green Activities page for more suggestions. The page is updated each year, so continue to check back! ​https://www.b4usa.com/ - You can find almost anything on this website that is American made. Buying products made in the USA is environmentally wise because it decreases the energy used and greenhouses gases released because of shorter transit distances, and it means the products have to meet the safety and toxicity standards of the United States. https://4ocean.com/ - Pull 1 lb. of plastic out of the ocean with each purchase from this great organization. They are taking tons of plastic out of river outlets and oceans! https://therainforestsite.greatergood.com/ - Just click once (it's free!) each day, and you can save about 21 square feet of rainforest! www.ecologyfund.com/ecology/_ecology.html - With a few more free clicks each day, you can protect endangered species, reduce pollution, and more! shop.arborday.org/donate-fire.aspx - The Arbor Day Foundation will plant trees in the United States for your school for as small of a donation as $25. Michigan has caught on to a new worldwide trend called Repair Cafe. Instead of throwing broken items away, you can have access to necessary tools and guidance to get them repaired for a new life. Saginaw, Petoskey, and White Lake Township are among the towns with access locally. Find one near you at repaircafe.org/en/. It takes 450 years for plastics to decompose. Paper or plastic shopping bags? Paper is a better environmental choice, and reusable cloth bags are even better! The average American throws out 82 lbs. of clothing a year! Lake Erie is starting to be called the new Dead Sea. Lake Erie tested out for 1.7 million plastic particulates per square mile. These particulates harm people and animals through the release of BPA, a toxic chemical. Many marine animals also fatally swallow larger pieces of plastic. 22 billion plastic bottles are thrown away annually; that's enough to circle the earth four times! The EPA has a list of EPA-tested, recommended cleaners and other maintenance items. Your school can start using these once it uses up what it already has. Look for the Safer Choice Label for an easy way to know that the product meets the EPA standards on toxicity. To learn more, visit www.epa.gov/saferchoice. 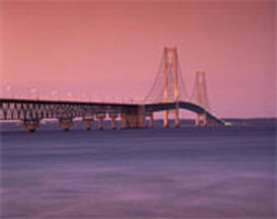 The Mackinac Bridge connects our two peninsulas and our Michigan Green Schools from Berrien Springs to Keeweenaw. 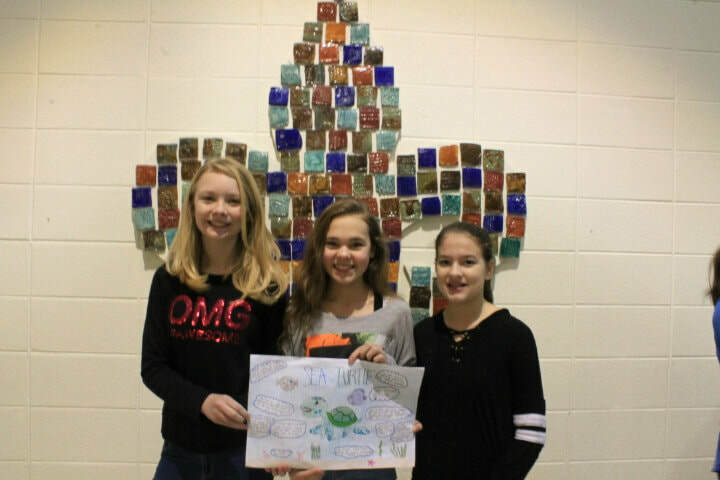 Students from St. Clair Middle School are featured with artwork created from recycled bottles. 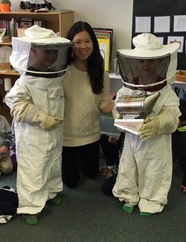 Students have fun learning about bees at Go Like the Wind Montessori School in Ann Arbor. 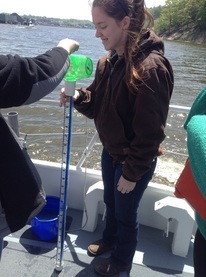 An Allegan High School student tests water quality in a local river that feeds into Lake Michigan. 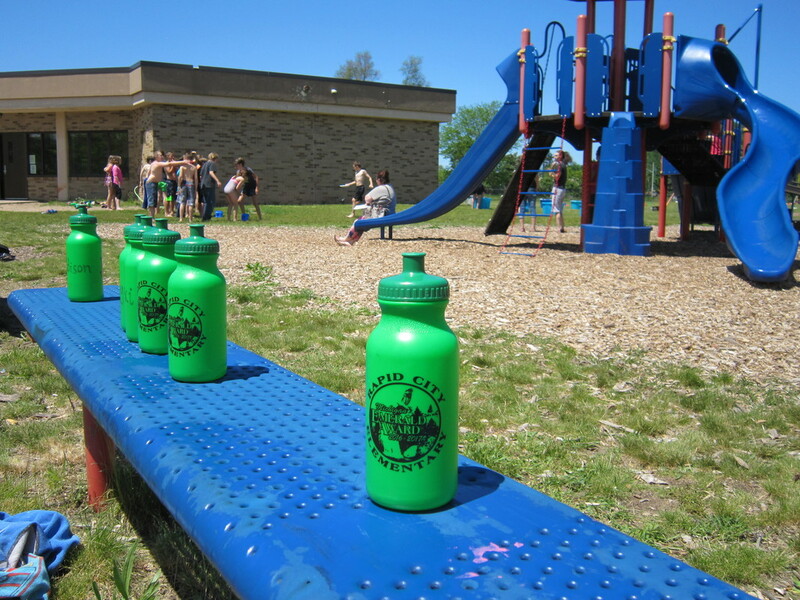 Great Lakes protection is a top goal of Michigan Green Schools. 3rd grader from Pentwater schools poses beside a Honey Locust Tree cutting on a field trip to the Halcyon Nature Center in Pentwater. Preparing an area for a butterfly garden in Ann Arbor. Planting dill will bring in Yellow Swallow Tail butterflies. The Great Lakes are a Michigan treasure. You can help keep them safe and clean by responsibly discarding all old prescriptions and pills. This is the 2018-19 Michigan Green School emblem. This attaches to the official green flag. There are green and emerald versions as well. ​Michigan Green Schools is not affiliated with Michigan Green.